The word 'lacunar' in ‘lacunar infarct’ refers to minor damages with a diameter of 1 to 15 millimeters that are called ‘lacunes’. They appear to be small holes in the deeper brain areas, for example the areas of the brain stem or of the basal ganglia. They are also often seen in the fiber web (internal capsule) of white matter which is located at the bottom of the area between the hemispheres of the large brains. The word "infarction" refers to the problem that the blood vessel has become clogged and by this it can not deliver oxygen and nutrition to a brain area. In the case of a lacunar infarction, it usually involves changes in the vessel wall of the small, deeper blood vessels, branches of the cerebral arteries, by which blood vessels become clogged. Usually this is caused by high blood pressure that has existed for a long time. In young people with a lacunar infarction, a cause cannot always be found. A quarter of the cases of cerebral infarction is a lacunar infarction. In general, people with lacunar infarction have a better prognosis than people with larger infarcts. That means that there is more chance of an independent life. It has been shown that there is a chance of 'parkinsonism', that is, symptoms similar to Parkinson's disease. That does not mean that there are no invisible residual phenomena. In particular, the invisible consequences are often underestimated by the environment. In recent years, there has been more research on the cognitive and emotional consequences after a lacunar infarct. It appears that people especially experience problems performing complex tasks, multitasking, arithmetic and dividing attention. Also problems with remembering new information and delayed information processing occur. The Dutch neuropsychologist Martine Zandvoort found that people with a minor stroke often have difficulties performing complex tasks. She obtained her doctorate on this in 2001. People with lacunar infarction also appeared to have changes in the emotions, easy in tears, sometimes depressed and irritated more quickly. They appeared more likely to sleep poorly. We recommend a good rehabilitation, but it is also important to keep an eye on the cognitive consequences. The sooner people are tested for cognitive damage the faster the more people can mentally adjust to these changes in life. 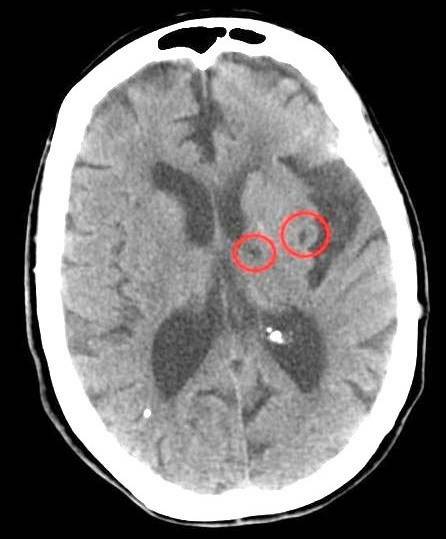 The presence of a so-called 'lacunar syndrome' was found to be a correct clinical indication of the existence of this infarction in 90% of people with lacunar infarction in a neurological examination. There appeared to be no dropout of a visual field (hemianopia) or a glare, no aphasia, no hemispatial neglect or other functional disorders but combinations of single-sided sensory and movement-failure symptoms. The symptoms of failure were mild to moderate in severity. The deficits were found mild to moderate in severity. Pure Motor Syndrome (PMS). One-sided purely motor failure of two of the three following three areas: face, entire arm or entire leg. Complaints of reduced feeling may be present but there are no sensory disturbances. Problems with swallowing (dysphagia) and difficulty in pronouncing words can be present (dysarthria). PMS occurs in 33 to 50% of lacunar infarcts. Pure Sensory Syndrom (PSS). One-sided, not always objectifiable sensory disorder, in two of the three areas: face, entire arm or entire leg. Sensorimotor syndrome (SMS). Objectivable sensory impairment on the side on which the injury has affected the brain, with two of the three areas: face, entire arm or whole leg. Ataxic Hemiparesis/Dysarthria-Clumsy Hand Syndrome (AH/DCHS). Awkward coordination (ataxia) on the side on which the injury has hit the brain, which cannot be explained as coming from the cerebrum with an appropriate muscle weakness or incomplete paralysis (paresis). Due to the fact that a lacunar infarction is sometimes not recognized with a FAST test (FACE-ARM-SPEECH-TIME) or "mouth-speech-arm = stroke alarm", we ask all people who had abnormal complaints that via social media to tell. So that a lacunar infarct can be recognized more quickly in the future.